Palm Sunday is coming up faster than any of us expected! (At least that’s the general feel around Catholic Icing’s facebook page! 😉 So I thought I better get to posting about it! 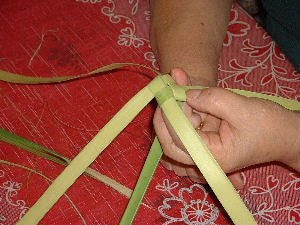 great website about palms- including great tutorials for palm weaving! to include a donkey and palm tree on your Palm Sunday table! and a printable donkey from my stand up printable nativity set. 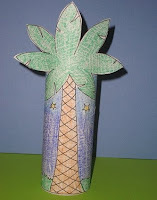 Sunday School Kids has a bunch of great Palm Sunday crafts! I love the palm of palms made with the hands. What a great idea! Hi, Lacy! I LOVE your blog, just wish I had the creative energy to do all the great crafts you post! One thing about the purple cloths: on the new calendar Palm Sunday is combined with Passion Sunday, but the final two weeks of Lent are still technically Passiontide and the purple cloths are put up the Sunday before Palm Sunday (on the "old" calendar used for the Tridentine Mass the Sunday before Palm Sunday is "Passion Sunday" to mark the transition to focusing on the passion in preparation for Holy Week). Another Sunday that is often forgotten is Laetare Sunday, the Fourth Sunday of Lent, which marks the halfway point of Lent and focuses on rejoicing. If you ever make a revision to your colorable Lenten calendar, it might be fun to add Laetare Sunday that the kids could color pink, and maybe note that the last two weeks of Lent are Passiontide. Love the idea of decorating the table with palm trees! I love all of the ideas! Thanks!! About the clothes, I know they are put up in Germany (and much of Eastern Europe) on Passion Sunday. Traditionally it was done in black, but purple is becoming more popular. I've never heard of this before, but our new parish observes it on a different Sunday. We are also in a different diocese. So, maybe each bishop does it differently.